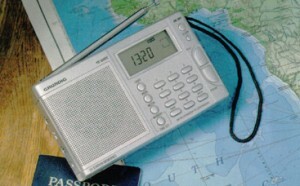 The Grundig YB-300PE is a small portable shortwave radio based on the classic “Yacht Boy” radio series. Though mostly out of production, Universal Radio still carries a supply of the YB-300PE. This entry was posted in Grundig, Portables and tagged Grundig, Grundig Yacht Boy, Grundig YB-300PE, Grundig YB-300PE Reviews, YB-300PE. Bookmark the permalink.